Mrs. Crosby loves to play, and the more exotic the location the better. This sweet transitional sweater will keep you comfortable anywhere in the world, from the Mediterranean to lovely Turks & Caicos. The peek-a-boo lace panel at the bust is interesting without baring a lot of skin, and offers a fun change for the knitter as well. 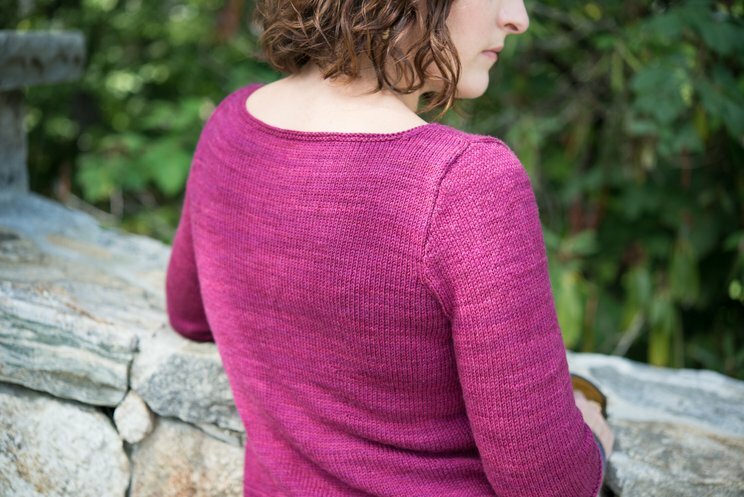 Simple Garter stitch trim ensures that all eyes are on the knitter and the yarn, rather than the sweater design (which is as it should be). Mrs. Crosby Loves to Play is a wonderful yarn line from the same people who bring us Lorna’s Laces. Hat Box in particular is one of my all-time favorite yarns: It’s light, has a slight sheen and great drape, and offers incredible stitch definition and a great knitting experience. It comes in a selection of very fun colors, and I highly recommend it for this sweater. Sample shown is in the color "Hollywood Cerise". To make a standard-size 30 (32, 34, 36, 38, 40, 42, 44, 48, 52, 56, 60)’’ / 76 (81.5, 86.5, 91.5, 96.5, 101.5, 106.5, 112, 122, 132, 142, 152.5) cm sweater, you'll need approximately 3 (4, 4, 4, 4, 5, 5, 5, 5, 6, 6, 7) hanks of the original yarn.